I find it interesting that the hateful and anti-Islamic comments are easily approved, yet different viewpoints are often suppressed by CBC. I don't agree that this cartoonist should be killed, as much as I strongly disapprove at his portrayal of Islam being a religion of terror. Of course it can't be denied that extremists don't do much to stop this perception, but ask yourself, why do so many posters want to associate extremists as being part of mainstream Islam? There is not a religious scholar in the world that verifies the viewpoints of the Christian fundamentalists that are trying to get everyone riled up against Islam. The goal of the Christian fundamentalists is to spark a larger and world wide conflict because they believe it will hasten Armageddon and the return of Jesus. It's just ridiculous that there are organized groups on different forums who are spreading their message of hate and propaganda against all Muslims. People wake up, the media even says this is the work of "extremists". I can't fathom how anything bad that any Muslim does can be portrayed as a reflection of all Muslims. Imagine if we applied this racist and hateful ideology against everyone else? It's just not right and ironically these people say "why don't Muslims speak up about their views". Well the answer is that we've tried, but our charity work and true beliefs are ignored by the media and only stories like this ever get published, and it just ends up furthering the agenda of fundamentalist Christians who's goal is to destroy Islam. We're tired of being held responsible for the actions of any other Muslim, this is discrimination at its finest. As a Muslim who believes in peace, freedom, and harmony among all people and religions I'd like to hear the same thing from others. Aces High: "And, what? There's no dedicated groups in the Muslim work spreading hate and propaganda about Christians and Jews? Come on." It looks like my comments really hit home. If there were so many Muslim groups spreading propaganda I'm sure there wouldn't be so many disagrees to the comments I've made. Now considering that my comments highlighted that there are dedicated Christian fundamentalist groups out there trying to destroy Islam and create a conflict due to extreme beliefs, it definitely shows there is something to it. I've noticed this theme over and over again, I reach out to the people who are spreading hate against Islam and never see the same response, just more hate against Islam. The fact that I said as a Muslim I believe in living peacefully and harmoniously and people disagree to it and don't seem to want to live peacefully with others should be disturbing to the casual reader. At some point it will be clear to the world that there is another more prevalent and viral extremism out there, and that it pales in comparison to the minority of extremist Muslims. The KKK and other hate groups have killed more people and continue to do so with impunity than any Muslim groups ever have. I'm not even including George Bush and the like who keep saying "Iraq is god's plan"........maybe they should explain in detail what they believe god's plan is, so the world can finally understand who the real terrorists are. It's really devious to hide your own extreme views of hate and religious beliefs while "preaching about the evils of Islam". I'll repeat that as an educated and devoted Muslim that I live peacefully with all faiths and cultures. MASSEY JONES I generally agree with your comments, but I'm disturbed that you expect all Muslims to go marching around saying "we denounce this". Why should all Muslims be held accountable for the actions of one? And FYI, many Muslims do denounce these actions and people, but you'll never hear from us. You'll always see the message of an extremist, but you'll never see a story about the other 99.9999% of Muslims. I'm assuming you're probably caucasian, so how would you feel if I went around saying all whites should denounce the KKK if they don't believe in them? Doesn't this sound like what happened to the Japanese and many other victims of racism in North America? You seem like one of the more liberal posters so I'm going to assume at this point your comments are more out of fear and concern about the situation rather than inciting hate against all Muslims. Just remember that if a plane goes down, Muslims will probably be on that plane and will be equally horrified as it goes down. Equally so, if another incident happens like this, I always dread it because I'll be getting bombarded from the general public and branded as some kind of terrorist who is obligated to declare "I don't believe in this". It's easy to come to conclusions without all the information and without being in the shoes of others. Let's just say, that there are far more victims than this poor Cartoonist and I'm one of them equally so just based on the comments here. A man arrested after a break-in at the home of Danish cartoonist Kurt Westergaard is carried into court on a stretcher in Aarhus on Saturday. 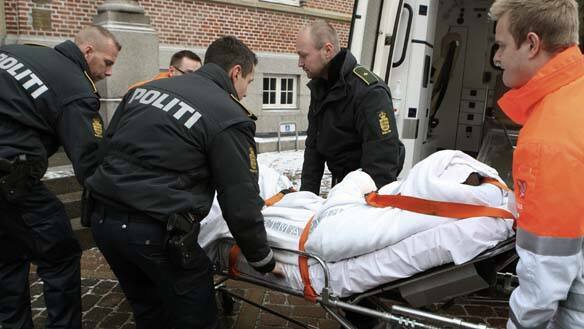 (Ernst van Norde/Polfoto/AP)A Somali man, strapped to a stretcher, was carried into court in Denmark on Saturday to be formally charged with trying to kill a Danish artist whose 2005 caricature of the Prophet Muhammad provoked outrage among Muslims around the world. The suspect, 28, faces two counts of attempted murder. Police in the city of Aarhus were called to the home of Kurt Westergaard, 75, on Friday night to confront a man armed with an axe and a knife, said Jakob Scharf, head of Denmark's PET intelligence agency. The artist, who has received previous death threats, pressed an alarm after the man broke a window and entered his home. Westergaard and his visiting five-year-old granddaughter fled to a specially made safe room. Officers shot the suspect in the knee and hand when he threatened them with the axe, police said. The suspect's name was not released in line with Danish privacy rules. A cloth covered his face to conceal his identity as he was wheeled into court in Aarhus, 200 kilometres northwest of Copenhagen. Police said the man's wounds were serious but not life-threatening. Westergaard remains a potential target for extremists nearly five years after he drew a caricature of the Prophet Muhammad, a drawing that was published along with 11 others in the Jyllands-Posten newspaper. Jakob Scharf, who heads the PET intelligence service, said the attempt on the artist's life was "terror related." The suspect is alleged to have ties with the Islamist militant group al-Shabaab in Somalia. Scharf said the man had been under PET's surveillance but not in connection with Westergaard.